I want to check the tradeleads. Do I need to log in? Will I have any benefits when I log in? To avoid illegal, pornographic, gambling website breaking into Commerce, we would like to ask you to register in advance that you login and visit on our website. Once your register is successful and you are a Commerce member, you will get a set of ID and password. After that, you will have an exclusive studio where review, update, receive of information here to make your business alert. You will benefit here, of course you should be a Commerce member. When do I receive my ID and password after applying for membership? If I have my ID and password, can I use the function of My Commerce? If I can't log in with my ID and password, what shall I do? Every member of Commerce Online has his own ID and password. When your login failed, please check the ID and password, which might be capital and make sure they are correct. Please note the ID is composed of an English letter and several roman numerals. We are sorry that the ID we gave can be not changed to your favorite. If you still can not log in, please email us. Where the tradeleads come from? We have two kinds of mail. Here is the clarification between Inquiry or Trade Lead mails. Inquiry mails are the mails in which buyers find your company on our Commerce website and intend to ask certain inquiries or questions so as to have the business and keep contact with you. On the other hand, Trade Lead mails are the ones buyers post their request online and look for suppliers around the world. In this case, buyers don’t have specific preferences with regard to companies they want. Therefore, Commerce Online will help those buyers to send their requests to other sellers so as to enhance the cooperation between buyers and sellers. What is "post an offer" ? It means that the buyer (seller) want to buy (sell) some products. You can left your message and describe what kind of products you want to buy (sell). After that, we will post an offer to our board. What advantages will I get if I post an offer here? You do not need to pay any fee when you post an offer. We will show them to all the buyers and they can find you easily. Where I can post an offer? You can come to 「Treadleads」and choose「post an offer」. It will show a page. You can fill out your message and describe what kind of products you want to buy (sell). After that, you can send it and we'll receive and post it. After your submitting, the system will post your offer on Commerce Bulletin Board automatically. Where can I find the offer to buy/sell? On Commerce Homepage, you can find the tradeleads area. Only you click tradeleads area and you will easily find out (offer to buy) and (offer to sell), which provide the latest tradeleads here. How to reply the trade lead mail in your mail box? Step3: Your mail has been sent out successfully. What are trade lead mails and inquiry mails? 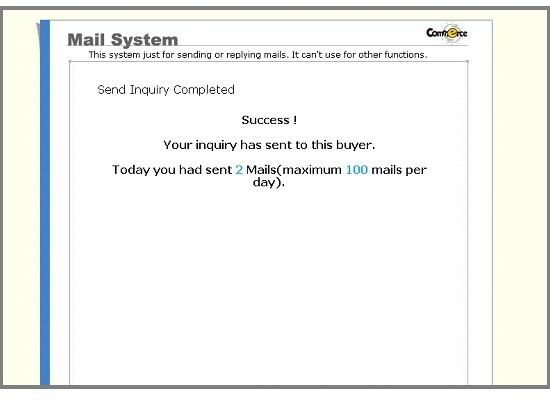 "Trade Leads Mail" is sent by our system, which match buyers' demand to sellers' product. In order to protect buyers' privacy, you cannot have buyers' information directly, and have to reply to buyers through Commerce Online. 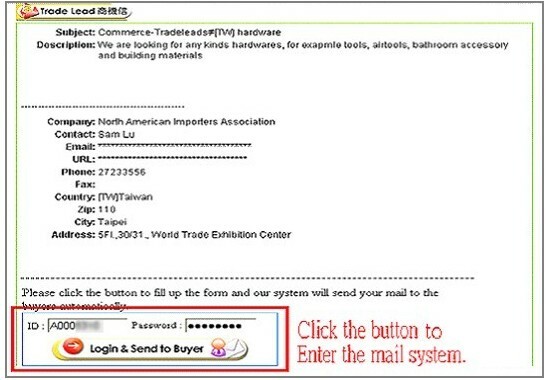 In the middle of the trade leader mail, you will see a button " Login & Send to Buyers". Then you can send your product information to buyers directly, and the buyers will decide to contract you or not. "Inquiry Mail" is sent by buyers who found your company information and product on Commerce Online, and would like to contact you directly. Therefore, You can have buyers' mail address and reply them directly. If you cannot see the reply button in TradeLeads, or email address in Inquiry, it means that you have used up our service. Various additional services related to cyber trade have been provided here in "Biz service". i. e. Exhibition, Trade Info., Credit Verification, Customs Info. and Transportation. What kind of Biz service is in Commerce? There are 5 sections in this range: World Trade Link, Search Engine, Trade Organization, Biz service and Trade tools. What is "World Trade Link" ? We are aimed to promote global trade points and develop trade resource. If your website is also a B2B portal and dedicate to offer trade information or business opportunities, we would love to establish a reciprocal link with your website. Should you be interested in exchanging banner with us, please contact us soon. What is "Global Search Engine" ? Welcome to Global Search Engine under Commerce Online. Here this sector is dedicated to you to submit your site (URL) to the global search engines. Make your company/products available to the potential clients all over the world. Meanwhile, you also can search whatever you want to find by utilizing these powerful worldwide search engines gathered by Commerce Online. What is "Trade Organization" ? Trade Organization links the premier trade and well-known websites all over the world which serves as a support center for Commerce members to search the available resource for your Global trade business.Through Trade Organization you can grasp the newest information all the time. What is "Trade Tools" ? Trade tools provides high-quality value-added services that eliminate barriers to successful international business i. e. Travel Guide, Hotel reservation, Airlines Info. , Weather forecast, E-New, Finance and Currency. I don't know how to classify? Upon entering your keyword of product to Commerce search engine, you can refer to the path for product classification list. Then, you will clearly and easily classify your product at proper product classification.Or, you can classify according to your product character at product classification by your own. If I can't find my company product's keyword,what can I do? If you can't find the suitable keyword for your product, you can go to My Commerce/My VIP => Want to sell to send your keyword to us.We'll add new product items for you in our category after our approval. What are benefits for classifying our products? 2.According to the categorized key words you’ve classified with, the Commerce Trade Lead Mail systems will match the profitable Trade Lead Mail for you. How can I find the products that I want to search? Please enter the keyword of the products you want to search, the system will be listed and shown you the suppliers automatically. How can I send emails to buyers if I am interested in the tradeleads? Members of our Commerce Online website will start to receive Inquiry or Trade Lead mails while they join our member club. 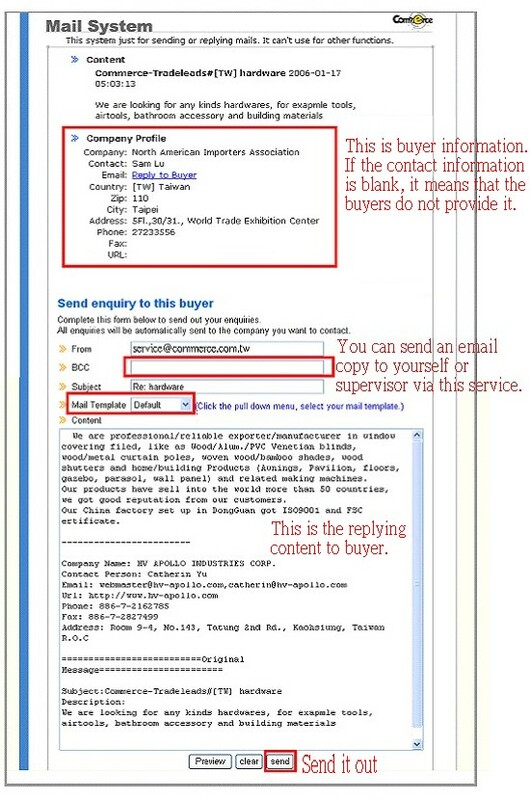 Here is the clarification between Inquiry or Trade Lead mails. Inquiry mails are the mails in which buyers find your company on our Commerce website and intend to ask certain inquiries or questions so as to have the business and keep contact with you. On the other hand, Trade Lead mails are the ones buyers post their request online and look for suppliers around the world. In this case, buyers don’t have specific preferences with regard to companies they want. Therefore, Commerce Online will help those buyers to send their requests to other sellers so as to enhance the cooperation between buyers and sellers. If you intend to enjoy our services, we suggest that you can join our member club. It depends on your demand while you are wondering which kind of member you would like to be. More importantly, if you join our member club and become our paid members, it will enhance the opportunity of success regarding your cooperation with other buyers. Why should I need to pay the fee, if I want to send emails to buyers? These letters were post by buyers. It means that the buyers want to buy some products urgently. Hence, all the tradeleads have potential chance to be a successful business. We ask members to join member club just charge tradeleads' handling and service fee. We do not receive any agency price anymore. It is commerce's honor to help our member to be a successful business. I want to join Member Club, and how many terms of payment? While you are at Member Club, your choice is depended on your requested. Please refer to the description in details and you will know how to pay for it. By the way, we can receive your payment. What kind of service is provided on Commerce Showroom? We are a B2B website portal that provides you a free area to promote your products on internet, we enhances more opportunities for you to contact with buyers all over the world. How to create my products on Commerce Showroom? Before you enter into Taiwan Commerce's Showroom, you have to join with us to be a free member. When you submit your information and succeed being our free member. Then, you will get a set of ID and Password that is necessary when you start creating your pictures of products on Commerce showroom.And Commerce Online provides the hint with each step to help you to create showroom. Can I modify my information on Commerce Showroom? Yes, please log in and you will easily link to my commerce and proceed modifying your product information at any time. How can I create and replace my photo on Commerce Showroom? Only you login, you will easily link to my commerce and proceed creating your photo at my commerce. If you are the first time to create new photos, please select the button of product list to create. If you want to replace your photo, please select Modify or delete. Then, click the one you want to change and select the browse to replace new ones. How many photos are created on Commerce Showroom? You have 3 photos to spotlight your products at Commerce Showroom.If you have more than 3 photos, you can replace your photos at any time. Can I have my photos especially for advertising at Commerce Showroom? Is it free or not ?